This is the starting point for a journey across the country which gave rise to the “red wave” in Latin America. Does Venezuela represent the dream of a new socialist society or is it just another distortion of populism and dictatorship? A trip with President Chavez over the largest oil reserve in the world, situated beneath the Orinoco river, becomes the occasion in which to enter into the lives of Venezuelans, nine years after the beginning of the Bolivarian revolution. The government missions to fight illiteracy and hunger, the creation of a public health care system and the development of an economy based on cooperative work are some of the achievements which characterize the Chavez era. On the other hand are the country’s 60 violent deaths a week and its collapsing hospitals, the closure of the most popular television channel, the old European immigrants in flight, the opposition black list and the ubiquitous government propaganda. Venezuela en route to socialism: is this still possible in our post-ideological times? This is an excellent documentary on Chavez's Venezuela. A couple of young Italian directors went there to see with their own eyes how the Bolivarian revolution ideals were being implemented. They were disappointed but kept a cool balance throughout the making of this film. They went to the roughest neighborhoods of Caracas as well as with the richest elites. They went to see how the much boasted national health policy is implemented in the hospitals. They went to see what is available in the market for normal people. They spoke with immigrants, students and journalists. They also spent a whole day traveling around the country with Chavez himself, asking questions and thus allowing the viewer a chance to come to independent conclusions on the pros and cons of his rule. Here is a trailer of the documentary in English. You can buy the DVD here, in original Spanish with English subtitles. The Cooperative Suttvuess based in Rome has been working in the field of research, audiovisual production and post-production since 2000. It was born as a post-production company for cinema and television. Over the years however, the cooperative has enlarged its field to the production of historical and inventive documentaries as well as commercial and social advertisements. 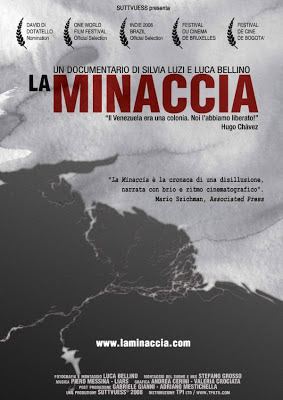 Or go to La Minaccia's blog. 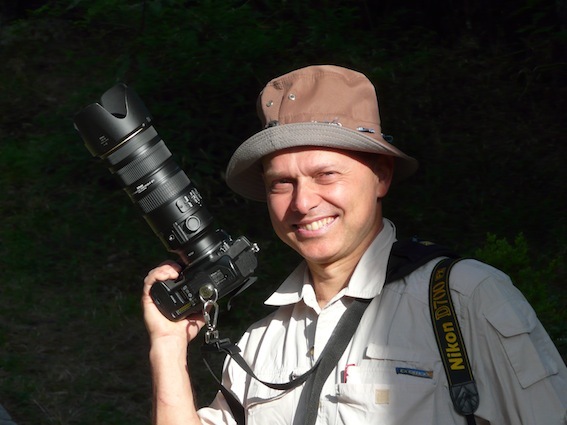 (ANSAmed) - ROMA, 6 MAR - "Incontro folgorante. Sguardo lucido, potente, parole arcaiche e destabilizzanti. Il potere iscritto nel dna, non nelle mostrine". 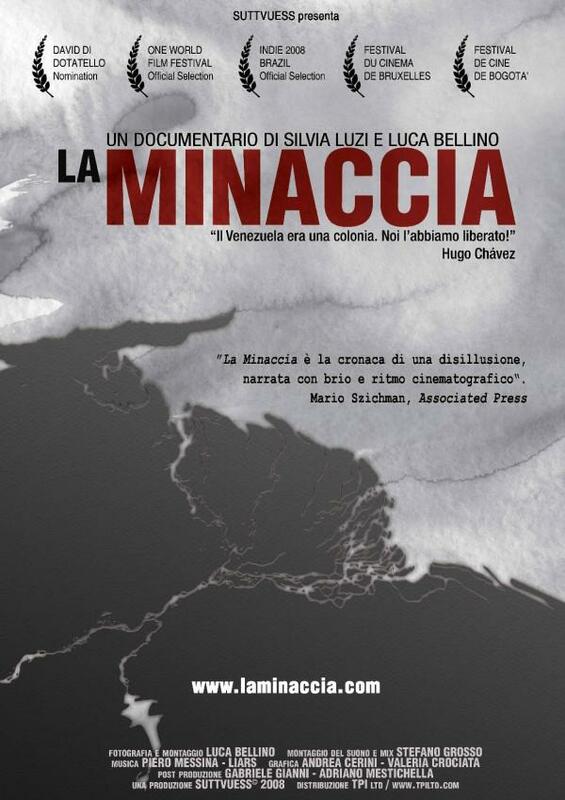 Così i giovani registi italiani Silvia Luzi e Luca Bellino raccontano il loro primo incontro con Chavez nel luglio del 2007, quando giunsero in Venezuela per girare il loro documentario "La minaccia", sui "diversi e contraddittori aspetti - dicono - della rivoluzione bolivariana". "Ci siamo incontrati all'aeroporto militare di Caracas all'alba - ricordano parlando con l'ANSA - pronti a partire per la diretta della trasmissione televisiva Alò Presidente. Sono bastate poche parole e ci ha voluto in volo con lui. 'Tu mi sembri Claudia Cardinale... e tu John Lennon! ', ci ha detto. E siamo partiti canticchiando Domenico Modugno". "Volo avventuroso - proseguono - e destinazione segreta. Abbiamo trascorso insieme tutta la giornata, tra l'elicottero, l'aereo presidenziale, il set televisivo (presentati come invitati speciali) e misteriosi aeroporti militari". Un'esperienza unica, visto che "il Presidente non rilasciava interviste a media italiani da molti anni". "Poi siamo rimasti altri due mesi in Venezuela - ricordano ancora Luca Bellino e Silvia Luzi - e abbiamo continuato le riprese mettendo da parte la fascinazione per la persona Chavez. Abbiamo raccontato un Venezuela diviso, in perenne stato di agitazione e di paura". "Ma quello che non si vede nel film - concludono - è che Chavez ha regalato al Venezuela qualcosa che sarà possibile constatare solo d'ora in avanti: una passione politica e civile rara e preziosa, una coscienza critica che andrà ben oltre il chavismo o il socialismo petroliero. (ANSAmed).